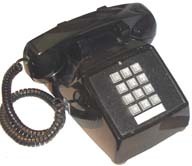 This is the phone that was the follow on to the 500 dial phone. This one has a 12 key Touch Tone dialing pad. Inside it still has real bells. When you have a phone that's conected to the line it's not a good idea to leave it off hood. That 's why in the photo above the handset is holding down the hook switch. This is the phone that's just ot the left of my computer keyboard. Since there's no battery or wall wart needed to power this phone, it works fine when there's a power outage. It seems outages are getting more common as power poles are being replaced. 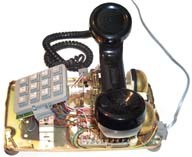 so it's not a real Bell System phone. I use this as my office everyday phone. The only downside is that there is no redial function and it takes up a lot of desk space.